Chris Gibson - The Natural Expert: A New Season to Celebrate Good Health Is On The Way! A New Season to Celebrate Good Health Is On The Way! 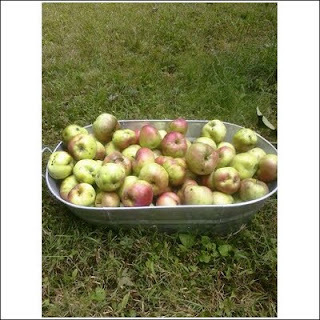 I spent this last weekend picking fresh organically grown apples I grow in my small orchard. I look forward to the fresh fruit season every year when it starts with the blueberries in July. Obviously I know that fresh fruits are filled with life enhancing properties. The apples however are really special! Now those of you who have read any of my books already know of the incredible healing I received using apples in a fast many years ago. A huge part of the method in my skin care book "Acne Free in 3 Days" revolves around apples. Such a miracle they helped perform that apples, oddly enough, have altered the course of my personal and professional life. Especially where the health of skin is concerned. If you have not read "Acne Free in 3 Days" yet, you can learn more about it by clicking the next link below. There is even a very good television interview on that site where I talk about how to care for the skin in general! Be sure to check that out. The funny thing about these apples (which are allowed to grow without chemical interference) is that they don't look perfect. They are not all uniform in size, color, or spot free. They certainly reflect their time out in the elements. But every year I have people ask me to give them some of them, because of their unbelievable flavor and the health benefits they have heard me preach about for years! I have even carried a few of these apples for display on television shows with me as well. All of the things I grow here are important to me, but the apples hold a special place for me because of what they represent. A lifetime of good health! So I am excited that fall is coming with its harvest of very healthy fruits and vegetables. Pumpkin, late summer squashes, and the like all hold high amounts of beta carotene and vitamins essential for health. Maybe Mother Nature designed it that way to help us humans beef up the immune system through what we eat in time for the coming winter. She knows best you know. I hope the coming fall finds everyone healthy and happy. Warm days and cool nights, the changing of the leaves, all signal a time to reflect on the year so far and prepare for the holidays and fun ahead! I always like to give everyone more access to information that you can use today so visit the next link below to get step by step information on how to keep your skin healthy, clear, and eternally youthful looking!